On Saturday April 8th 2018, at Deerfield (Illinois) at the invitation of Catholic Family News, and on Monday April 10th at Norwalk in Connecticut, as a guest of The Society of St. Hugh of Cluny, Professor Roberto de Mattei, delivered addresses on the theme: Tu es Petrus: true devotion to the Chair of St. Peter. Here is the text of his conferences. We find ourselves before one of the most critical moments that the Church has ever experienced in her history, but I am convinced that true devotion to the Chair of Saint Peter can offer us the weapons to come out of this crisis, victorious. True devotion. Because there is false devotion to the Chair of Peter, just as – according to Saint Louis Marie Grignion de Montfort – there is a true and false devotion to the Most Blessed Virgin Mary. The promise of Our Lord to Simon Peter in the city of Caesarea Philippi is clear: Tu es Petrus, et super hanc petram aedificabo Ecclesiam meam, et portae inferi non praevalebunt adversus eam (Matt. 16: 15-19). The primacy of Peter constitutes the bedrock on which Jesus Christ instituted His Church, and on which She will remain solid until the end of time. The promise of the Church’s victory, however, is also the announcement of a war. A war, which, until the end of time, will be waged by hell against the Church. At the center of this fierce war is the Papacy. The enemies of the Church, throughout the course of history, have always sought to destroy the Primacy of Peter, because they have understood that it comprises the visible foundation of the Mystical Body. The visible foundation, because the Church has a primary and invisible foundation which is Jesus Christ, of Whom, Peter is the Vicar. Febronius claimed that he did not wish to challenge the Pope but the centralism of the Roman Curia, which he wanted to counterpose, with national or provincial episcopal synods. Pius VI condemned his theses with the decree Super soliditate Petrae of November 28, 1786. In Italy, analogous ideas were expressed by the Jansenist bishop of Pistoia, Scipione de’ Ricci. In 1786, Scipione de’ Ricci called a diocesan synod, with the intention of reforming the Church, reducing the Pope to being the ministerial head of the communities of the Pastors of Christ. Then the French Revolution broke out, and Pius VI, with the letter Quod Aliquantum of March 10, 1791 condemned the Civil Constitution of the Clergy, which affirmed that the bishops are independent of the Pope, that priests are superior to bishops, and that parish priests are elected by the simple faithful. With the bull Auctorem fidei of August 28, 1794 the ecclesiological errors of the Synod of Pistoia were also condemned. Pius VI, however, was overwhelmed by the Revolution. In 1796 Bonaparte’s fleet invaded the peninsula, occupied Rome, and on February 15, 1798, proclaimed the Roman Republic. The Pope was arrested and brought to the city of Valence in France, where he died on August 29, 1799, worn out by his sufferings. The Revolution seemed to have triumphed over the Church. The body of Pius VI was left unburied for several months, when it was brought to the local cemetery, in a trunk used as a casket for the poor, on which was written “Citizen Gianangelo Braschi – whose stage name was ‘Pope.’”The municipality of Valence notified the French Directory of the death of Pius VI, adding that the last Pope of history had been buried. Ten years later, in 1809 the successor of Pius VI, Pius VII, old and infirm, was also arrested, and after two years of imprisonment in Savona, was taken to Fontainebleau, where he remained until the fall of Napoleon, forced to bow to his will. Never before had the Papacy appeared to the world to be so weak. But ten years later, in 1819, Napoleon was gone from the scene, and Pius VII had returned to the papal throne, recognized as supreme moral authority by the European sovereigns. In that year, 1819 the book On the Pope (Du Pape) was published in Lyon, the masterpiece of Count Joseph de Maistre, a work which had hundreds of reprints, and which anticipated the dogma of Papal Infallibility, later defined by the First Vatican Council. The book On the Pope is considered as a manifesto of counter-revolutionary thought, which opposes itself to the Catholic liberalism of the Nineteenth and Twentieth Centuries. Here today, I would like to be an echo of this school of Catholic thought. When in 1869, the First Vatican Council opened, two parties clashed: on one hand, the ultramontane or counter-revolutionary Catholics, supported by Pius the IX, who fought for the approbation of the dogma of the Primacy of Peter and of Papal Infallibility. Among these were illustrious bishops, like Cardinal Henry Edward Manning, archbishop of Westminster, Louis Pie, bishop of Poitiers, Konrad Martin, bishop of Paderborn, joined by the best theologians of the time like Fathers Giovan Battista Franzelin, Joseph Kleutgen, and Henri Ramière. On the opposing side were the liberal Catholics headed by Monsignor Maret, dean of the theological faculty of Paris, and by Ignaz von Döllinger, rector of the University of Munich. The liberals, echoing the conciliarist and Gallican theses, held that the authority of the Church did not reside in the Pontiff alone, but in the Pope united to the Bishops, and judged the dogma of Infallibility to be erroneous, or at least inopportune. Pius IX on December 8, 1870, with the constitution Pastor aeternus, defined the dogmas of the Primacy of Peter and of Papal Infallibility. Today, these dogmas are for us a precious benchmark, on which to found true devotion to the Chair of Peter. Liberal Catholics were defeated by the First Vatican Council but after a century, they became the protagonists and winners of Vatican Two. Gallicans, Jansenists and Febronianists openly held that the structure of the Church has to be democratic, led from the bottom, by priests and bishops, of whom the Pope would be only a representative. The constitution Lumen Gentium,promulgated on November 21 1964 by the Second Vatican Council, was like all of the Council documents, an ambiguous one, which recognized these tendencies, but without bringing them to their final outcomes. The Nota explicativa praevia, [preliminary explanatory note] desired by Paul VI to save the orthodoxy of the document, was a compromise between the principle of the primacy of Peter and that of the collegiality of the bishops. That which took place with Lumen Gentium also occured with the conciliar constitution Gaudium et Spes, which placed on the same level the two ends of matrimony: procreative and unitive. Equality in nature does not exist. One of the two principles is destined to assert itself over the other. And, as is the case in matrimony, the unitive principle prevailed over the procreative, so in the case of the constitution of the Church, the principle of collegiality is imposing itself on that of the Primacy of the Roman Pontiff. Synodality, collegiality, decentralization are the words which today express the attempt to transform the monarchical and hierarchical constitution of the Church into a democratic and parliamentary structure. A programatic “manifesto” of this new ecclesiology, is the discourse given by Pope Francis on October 17 2015, during the ceremony for the fiftieth anniversary of the institution of the Synod of Bishops. In that speech, Francis used the image of the “upside-down pyramid” to describe the “conversion” of the Papacy already announced in the exhortation Evangelii Gaudium of 2013 (no. 32). It seems that Pope Bergoglio wants to substitute the Roman-centric Church with a polycentric or multi-sided church, according to an image he often uses. A renewed Papacy, conceived as a form of ministry at the service of the other churches, renouncing the juridical Primacy or government of Peter. To democratize the Church, the innovators seek to strip her of her institutional aspect, and to reduce her to a purely-sacramental dimension. It is the transition from a juridical Church to a sacramental Church, a Church of communion. What are the consequences? On a sacramental level, the Pope, as a bishop, is equal to all other bishops. That which places him above all the bishops and confers upon him a supreme, full and immediate power over the whole Church, is his juridical office. The specific munus of the Supreme Pontiff does not consist in his power of orders, which he has in common with all bishops of the world, but in his power of jurisdiction, or of government, which distinguishes him from every other bishop. The office which the Pope holds, does not represent a fourth level of Holy Orders following the diaconate, priesthood and episcopacy. The Petrine ministry is not a sacrament, but an office, because the Pope is the visible Vicar of Jesus Christ. The Church-Sacrament dissolves, with the visibility of the Church, the Primacy of Peter. Jesus Christ entrusted the mission of governing to Peter, after the Resurrection, when He said: “Feed My lambs, feed My sheep” (John 21: 15-17). With these words, Our Lord confirmed the promise made to the Prince of the Apostles at Caesarea Philippi, and made him His visible Vicar on earth, with the powers of supreme head of the Church and universal Pastor. True devotion to the Chair of Peter is not the worship of the man who occupies this Cathedra, but is the love and veneration for the mission which Jesus Christ gave to Peter and to his successors. This mission is a visible mission, perceptible to the senses, as explained Leo XIII in the encyclical Satis cognitum (1896), and Pius XII in his encyclical Mystici Corporis Christi (1943). Like her Founder, the Church consists in a human element, visible and external, and a Divine element, spiritual and invisible. She is a society, visible and spiritual, temporal and eternal at the same time, human for the members of which she is composed, and Divine for her origin, her end and her supernatural means. The Church has a first visibility because she is neither a spiritual current or a movement of ideas, but a true society endowed with a juridical structure; and a second visibility because she is supernatural society recognizable by her external marks, by which she is always one, holy, Catholic, apostolic and Roman. The Pope is he in whom this visibility of the Church is concentrated and condensed. This is the meaning of the phrase of Saint Ambrose Ubi Petrus ibi ecclesia, (Where Peter is, there is the Church) which presupposes to the other saying, attributed to Saint Ignatius of Antioch: Ubi Christus, ibi ecclesia. (Where Christ is, there is the Church). There is no true Church, outside of that founded by Jesus Christ, Who continues to guide and assist her invisibly, while her Vicar visibly governs her on earth. Today, there is a modernist infiltration inside the Church, but there are not two churches. This is the reason why Fr. Gleize judges speaking of the “Conciliar Church,” as inaccurate, affirming that two churches, the Roman and the Conciliar, do not exist. And this is also the reason for which we need to be careful of speaking of the “Bergoglian church,” or of “the new Church.” The Church today is occupied by churchmen who betray or deform the message of Christ, but it has not been substituted by another church. There is only one Catholic Church, in which today cohabitate in a confused and fragmentary way, different and counterpoised theologies and philosophies. It is more correct to speak of a Bergoglian theology, of a Bergoglian philosophy, and, if one wishes, of a Bergoglian religion (or irreligion! ), without coming to the point of defining Pope Bergoglio, the cardinals, the Curia and the bishops of the whole world as a “Bergoglian church.” Because, if we were to imagine that the Pope, the cardinals, the Curia, the world’s bishops comprise as a whole, a new Church, we would have to legitimately ask ourselves: “where is the Church of Christ? Where is her social and supernatural visibility? And this is the principal argument against sedevacantism. But it’s also an argument against that inflated traditionalism, which while not declaring the vacancy of the Seat of Peter, thinks itself able to kick out of the Church the Pope, cardinals and bishops, and de facto reduces the Mystical Body of Christ to a purely-spiritual and invisible reality. The Church, as a visible society, needs a visible hierarchy, a Vicar of Christ who governs her visibly. The visibility is, above all, that of the Chair of Peter, on which 266 Popes have sat until today. The Pope is a person who occupies a chair, a cathedra: there is no cathedra without a person, but the danger exists that the person will lead others to forget the existence of the chair, that is of the juridical institution which precedes the person. Papalotry is a false devotion which does not see in the reigning Pope one of the 265 successors of Peter, but considers him to be a new Christ on earth, who personalizes, reinterprets, reinvents and imposes the Magisterium of his predecessors, expanding and perfecting the doctrine of Christ. Papalotry, before it is a theological error, is a deformed psychological and moral attitude. Papalotrists are generally conservatives or moderates who deceive themselves on the possibility of reaching good results in life without a fight, without effort. The secret of their life, is always to adapt themselves, to bring the best out of every situation. Their watchword is that everything is calm, there’s no need to worry about anything. Reality, for them, has never the characters of a drama. The moderates don’t want life to be a drama, because that would oblige them to assume responsibilities which they don’t want to assume. But because life is often dramatic, their sense of reality is turned upside down, into an absolute unreality. Faced with the current crisis in the Church, the moderate instinctively negates it. And the most effective way to tranquilize one’s own conscience, is by affirming that the Pope is always right, even when he contradicts himself or his predecessors. At this point, error inevitably passes from the psychological level to the doctrinal one, and it turns into papalotry, namely to the position which states that the Pope must always be obeyed, no matter what he says or does, because the Pope is the only and infallible law of the Catholic Faith. On the doctrinal level, papalotry has its ideological roots in the voluntarism of William of Okcham (1285-1387) who, paradoxically, was a ferocious adversary of the Papacy. While Saint Thomas Aquinas affirmed that God, Absolute Truth and Supreme Good, could not will nor do anything contradictory, Ockham held that God could will and do anything, even evil, paradoxically, because evil and good do not exist in themselves, but are made that way by God. For Saint Thomas, something is commanded or forbidden inasmuch as it is ontologically good or evil; for the followers of Ockham, the opposite goes: something is good or bad, inasmuch as God has commanded or forbidden it. Once this principle is admitted, not only do morals become relative, but the representative of God on earth, the Vicar of Christ, can then exercise his supreme authority in an absolute and arbitrary manner and the faithful cannot but pay him unconditional obedience. In reality, obedience to the Church entails for the subject the duty of fulfilling not the will of the superior, but only the will of God. Because of this, obedience is never blind and unconditional. It has its limits in the natural and Divine Laws, and in the Tradition of the Church, of which the Pope is guardian and not creator. For the papalotor, the Pope is not the Vicar of Christ on earth, who has the duty of handing on the doctrine he has received, but is a successor of Christ who perfects the doctrine of his predecessors, adapting it to the changing of the times. The doctrine of the Gospel is in perpetual evolution, because it coincides with the magisterium of the reigning Pontiff. The “living” magisterium substitutes the perennial Magisterium, expressed by pastoral teaching which changes daily, and has its regula fidei (rule of faith) in the subject of the authority and not in the object of the transmitted truth. A consequence of papalotry is the pretext of canonizing all and each of the Popes of the past, so that retroactively, each words of theirs, every act of governing is “infallibilized.” However, this concerns only the Popes following Vatican II and not those who preceded that Council. At this point, arises the question: the golden era of the history of the Church is the Middle Ages, and yet the only medieval Popes canonized by the Church are Gregory VII and Celestine V. In the Twelfth and Thirteenth centuries, there were great Popes, but none of these were canonized. For seven hundred years, between the Fourteenth and Twentieth centuries, only Saint Pius V and Saint Pius X were canonized. Were all the others unworthy Popes and sinners? Certainly not. But heroism in the governing of the Church is an exception not the rule, and if all the Popes were saints, then nobody is a saint. Sanctity is such an exception, that it loses meaning when it becomes the rule. There is a doubt, that today they want to canonize all the Popes, because they don’t believe in anyone’ sanctity. Is a Papal Diararchy Possible? Papalotry does not exist in an abstract sense: today, for example, we need to speak in a more precise way of Francisolatry, but also of Benedictolotry, as Miguel Ángel Yáñez observed well, on Adelante la fé . This papalotry can come to counterpoising Pope against Pope: the followers, for example, of Pope Francis against those of Pope Benedict, but also of looking for harmony and coexistence among the two Popes, imagining a possible division of their roles. What took place on the occasion of the fifth anniversary of the election of Pope Francis, was significant and unsettling. All of the media’s attention was focused on the case of a letter of Benedict XVI to Pope Francis: a letter, which turned out to be manipulated and caused the resignation of the head of Vatican communications, Monsignor Dario Viganò. The discussion, revealed however, the existence of a false premise, accepted by all: the existence of a sort of papal diararchy, of which there’s Pope Francis who carries out its functions, and then there’s another Pope, Benedict, who serves the Chair of Peter through prayer, and if necessary, with counsel. The existence of the two Popes is admitted as a done deal: only the nature of their relationship is argued. But the truth is that it is impossible that two Popes can exist. The Papacy is not dismountable: there can be only one Vicar of Christ. 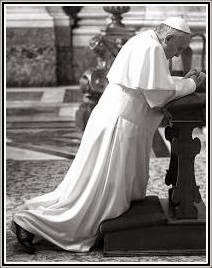 Benedict XVI had the ability to renounce the papacy, but consequently, would have had to give up the name of Benedict XVI, dressing in white, and the title of Pope emeritus: in a word, he would have had to definitively cease from being Pope, also leaving Vatican City. Why did he not do so? Because Benedict XVI seems to be convinced of still being Pope, although a Pope who has renounced the exercise of the Petrine ministry. This conviction is born of a profoundly-erroneous ecclesiology, founded on a sacramental and not juridical conception of the Papacy. If the Petrine munus is a sacrament and not a juridical office, then it has an indelible character, but in this case it would be impossible to renounce the office. The resignation presupposes the revocability of the office, and is then irreconcilable with the sacramental vision of the Papacy. Regarding the doubts, then, about the election of Pope Francis, Professor Geraldina Boni, remembers that Canonists have always taught that the peaceful “universalis ecclesiae adhaesio” (universal ecclesial acceptance) is a sign and infallible effect of a valid election and legitimate papacy, and the adhesion or acceptance of Pope Francis by the people of God has not yet been doubted by any of the cardinals who participated in the Conclave. The acceptance of a Pope by the universal Church is an infallible sign of his legitimacy, and heals at the root every defect of the papal election (for example, illegal machinations, conspiracies, et cetera). This is also a consequence of visible character of the Church and of the Papacy. Father Ghirlanda explains: “In the first case, the Apostolic See is vacant from the moment of death of the Roman Pontiff; in the second and in the third from the moment of the declaration on the part of the cardinals; in the fourth from the moment of the renunciation." At this point, Father Ghirlanda lingers on the case of a heretical Pope. There is no reference to a Pope, since in the month of February 2013, no one had yet been elected. Father Ghirlanda refers to an “academic example”: “There is the case, admitted by doctrine, of notorious apostasy, heresy and schism, into which the Roman Pontiff could fall, but as a “private doctor,” that does not demand the assent of the faithful, because by faith in the personal infallibility that the Roman Pontiff has in the carrying out of his office, and therefore in the assistance of the Holy Ghost, we must say that he cannot make heretical affirmations, wishing to utilize his primatial authority, because if he were to do so, he would fall ipso iure from his office. However, in such cases, because ‘the first see is judged by no one’ (Canon 1404) no one could depose the Roman Pontiff, but only a declaration of the fact would be had, which would have to be done by the Cardinals, at least of those present in Rome. Such an eventuality, however, although foreseen in doctrine, is held to be totally unlikely, by the intervention of Divine Providence in favor of the Church”. Father Ghirlanda is in this exposition, neither a traditionalist nor a progressivist, but a scholar who has gathered a thousand years of canonical tradition. If, in the field of philosophy and theology, the undisputed summit of Christian thought is represented by Saint Thomas Aquinas, in the field of Canon Law, the equivalent of that School, is represented by Gratian (Magister Gratianus) and his disciples. Recalling an assertion of Saint Boniface, bishop of Mains, Gratian affirmed that the Pope “a nemine est iudicandus, nisi deprehendatur a fide devius” (is judged by no one, except when he deviates from the Faith). This principle is reiterated in Summa decretorum, by Huguccio, or Hugh of Pisa, considered the most famous magister decretorum, master of decrees, of the XII Century. Father Salvatore Vacca, who traced the history of the axiom Prima Sedes a nemine judicatur (the First See is judged by no one), recalled that “the thesis of the possibility of a heretical Pope would be held in consideration... during the whole of the Middle Ages, until the time of the Western Schism (1379-1417). In the case of a heretical Pope, the principle according to which Prima Sedes a nemine judicatur , is not violated, in the first place because, according to canonical tradition, this principle admits only one exception, the case of heresy; in the second place because the cardinals would be limited to only certifying the fact of heresy, as would happy in the case of the loss of mental faculties, without exercising any deposition of the Roman Pontiff. The cessation of the primatial office would only be acknowledged and declared by them. Theologians argue whether the loss of the pontificate would arrive at the moment in which the Pope falls into heresy or only in the case of the heresy becoming manifest or notorious, and publicly spread. Arnaldo Xavier da Silveira holds that although an incompatibility in radice (at the root) exists between heresy and papal jurisdiction, the Pope does not lose his office until the time when his heresy becomes manifest. The Church being a visible and perfect society, the loss of the faith by her visible Head would need to be a public fact. As a tree can live for a certain time after its roots have been severed, so can jurisdiction be maintained precariously by the possessor, even after a fall into heresy. Jesus Christ maintains the person of the heretical Pontiff in his jurisdiction provisionally, until the Church recognizes the deposition. What is certain, is that recognizing the possibility for a Pope to fall into heresy does not mean in any way, diminishing the love for and devotion to the Papacy. It means admitting that the Pope is the Vicar, not always impeccable and not always infallible, of Jesus Christ, only Head of the Mystical Body of the Church. The theme of the visibility of the Church is an argument to combat another temptation widespread today: that of catacombism. Catacombism is the attitude of those who retreat from the battlefield and hide themselves in the illusion of being able to survive without fighting. Catacombism is the refusal of the militant conception of Christianity. The catacombist does not wish to fight, because he is convinced of having already lost the battle; he accepts the situation of the inferiority of Catholics as a given, without going back to the causes which have determined it. But if Catholics today are in the minority, it is because they have lost a series of battles; they have lost these battles because they have not fought them; they have not fought them because they have removed the very idea of the “enemy,” turning their backs on the Augustinian concept of the two cities fighting each other in history, the only concept that can offer us an explanation of what is happening, and what has happened. If one rejects this militant concept, one accepts the principle of irreversibility of the historic process and from catacombism one inevitably passes to progressivism and modernism. The catacombists oppose the Constantinian Church to the Minority and Persecuted Church of the first three centuries. But Pius XII in his address to Catholic Action on December 8, 1947, refutes this theory, explaining that the Catholics of the first three centuries were not catacombists, but conquerors. We need to recover this militant concept of the Christian life. There are those who say that we need to give up action and the fight, because by now there’s nothing left to do, on a human level. We need to wait on an extraordinary intervention of Divine Providence. Certainly it is God, and He alone, Who guides and changes history. But God requires the cooperation of men and if men cease working, Divine Grace will also cease to act. In fact, as Ambrose observed, “the Divine benefits are not passed to he who sleeps, but to he who watches.”. There are those who say that we need to forego not only action, but even speech. Sometimes we meet someone who with their finger at their lips, and eyes raised to Heaven, tells us that we need to keep quiet and pray. Nothing else. But it would be an error to make silence a rule of behavior, because on the day of judgement, we will answer not only for vain words, but also for guilty silences. There are vocations to silence, like those of many contemplative monks and nuns; but Catholics, from Pastors to the last of the faithful, have the duty of testifying to their Faith, with words and example. It was through the Word that the Apostles won over the world, and the Gospel was spread from the one end of the earth to the other. Saint Athanasius and Saint Hilary did not remain silent against the Arians, Saint Catherine of Siena did not keep silent in front of the Popes of her time, and, in recent times, these did not keep quiet but spoke: the bishop of Münster, Clemens August von Galen faced with Nazism, and Cardinal Josef Mindszenty, primate of Hungary, confronted by communism. Today, moreover, silence isn’t used as a moment of recollection and of reflection which prepares one for battle, but as a political strategy, an alternative to fighting. A silence which predisposes us for dissimulation, to hypocrisy and final surrender. Day after day, month after month, year after year, the politics of silence has become a jail which imprisons many conservatives. In this sense, silence is not only a sin of today, but is also a chastisement for yesterday's sins. Today, those who for too many years remained silent, are prisoners of silence. However, he is free, who in the course of the last fifty years has not kept silent, but has spoken openly and without compromises, because only the Truth makes us free. (John 8:32). Tempus est tacendi, tempus loquendi says Ecclesiaste (3:7): “There is a time to keep silence, and a time to speak.” And today is the moment to speak. To speak means, above all, to witness publicly one’s own fidelity to the Gospel and to the immutable Catholic truths, denouncing the errors which counteract it. In times of crisis, the rule is that which Benedict XV in the encyclical Ad beatissimi Apostolorum Principis of November 1, 1914 declared against the modernists: “It is Our will that the law of our forefathers should still be held sacred: "Let there be no innovation; keep to what has been handed down”: nihil innovetur nisi quod traditum est.” Sacred Tradition remains the criterium for discerning that which is Catholic and that which is not, rendering resplendent the visible marks of the Church. Tradition is the faith of the Church that the Popes have maintained and transmitted throughout the course of the centuries. But Tradition comes before the Pope and not the Pope before Tradition. Limiting ourselves, then, to a generic denunciation of the errors which oppose the Tradition of the Church, isn’t enough. 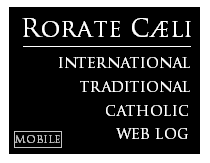 It is for us to call out by name, all those who inside the Church profess a theology, a philosophy, a morality, a spirituality, in contrast with the perennial Magisterium of the Church, no matter what office they may occupy. And today we must admit that the Pope himself promotes and propagates errors and heresies in the Church. We need to have the courage to say this, with all the veneration which is due to the Pope. True devotion to the Papacy expresses itself in an attitude of filial resistance, as happened in the Filial Correction addresses to Pope Francis in 2017. But there isn’t only a tempus loquendi (a time to speak). There is also a modus loquendi (way to speak), a way with which the Catholic expresses himself. The correction has to be filial, as it was, respectful, devout, without sarcasm, without irreverence, without contempt, without bitter zeal, without gratification, without pride, with a profound spirit of charity, which is love for God and love for the Church. In the crisis of our days, every profession of faith and declaration of fidelity which disregards the responsibility of Pope Francis, lacks strength, clarity and sincerity. We need to have the courage to say: Holy Father, you are the first one responsible for the confusion which exists today in the Church; Holy Father, you are the first one responsible for the heresies which are circulating in the Church today. The responsibility, finally, cannot not involve the cardinals who keep quiet, and who remaining silent, do not perform their duty as counselors and collaborators of the Pope. But it’s not enough to denounce the Pastors who demolish, or favor the demolition of the Church. We must reduce to the indispensable minimum the ecclesiastical cohabitation with them, as happens in an agreement of matrimonial separation. If a father exercises illicit physical or moral violence toward his wife and children, the wife, although recognizing the validity of the marriage itself, and without requesting an annulment, to protect herself and her children, can request a separation. The Church permits it. Giving up living habitually together means distancing oneself from the teachings and practices of the evil Pastors, refusing to participate in the programs and activities promoted by them. But we must not forget that the Church cannot disappear. Therefore, it is necessary to support the apostolate of Shepherds who remain faithful to the traditional teachings of the Church, participating in their initiatives and encouraging them to speak, to act and to guide the disoriented flock. It is time to separate ourselves from evil Pastors, and to unite ourselves to the good ones, inside of the one Church in which also live, in the same field, the wheat and the cockle. (Matthew 13:24-30), remembering that the Church is visible, and cannot save herself, outside of her legitimate Pastors. The Church is visible and will save herself with the Pope, and not without the Pope. We need to renew the bond of love and veneration which joins us to the Successor of Peter above all with prayer, so Jesus Christ will give him and all prelates the necessary strength not to betray the sacred deposit of the Faith, and, if this were to take place, to return to the guidance of the abandoned sheepfold. And yet, if the Vicar of Christ would betray his mission, the Holy Ghost would never cease to assist, not even for a moment, His Church, in which, even in times of defection from the Faith, a remnant, even a small one, of Pastors and faithful will continue to always keep and pass on Tradition, trusting in the Divine Promise: “I am with you all days, even to the consummation of the world.” (Matthew 28:20). For those who remain faithful to Tradition in times of crisis, their Model is the Most Blessed Virgin Mary, Who alone kept the Faith on Holy Saturday, and Who, after the Ascension of Our Lord into Heaven, did not keep silent but sustained with all the firmness and clearness of Her words, the nascent Church. Her Heart was, and remains, the Treasure Chest of the Church. Their battle against the enemies of God will bring closer the triumph of the Immaculate Heart of Mary, which will also be the triumph of the Papacy and of the restored Church. Frederick William Faber, La devozione e fedeltà al Papa, in AA. VV., Il Papa nel pensiero degli scrittori religiosi e politici, La Civiltà Cattolica, Roma 1927, II, pp. 231-238. For a synthesis of this thought, see Plinio Corrȇa de Oliveira, Revolution and Counter Revolution, The American Society for the Defense of Tradition, Family, Property, York (PA) 1993. Louis Billot, De Ecclesia Christi,I, Prati, Giachetti, 1909, pp. 49-51. S. Ambrose, Expositio in Psalmos, 40. S. Ignatius of Antiochia, Smirnnses, 8, 2. Fr. Jean-Michel Gleize, SSPX, “Angelus”, July 2013. Walter Brandmüller, Renuntiatio Papae. Alcune riflessioni storico-canonistiche (“Archivio Giuridico”, 3-4 (2016), pp. 655- 674, p. 660. Geraldina Boni, Sopra una rinuncia. La decisione di papa Benedetto XVI e il diritto, Bononia University Press, Bologna 2015. Gianfranco Ghirlanda, Cessazione dall’ufficio di Romano Pontefice, "La Civiltà Cattolica" q. n 3905 March, 2 th 2013, p. 445. Gratianus, Decretum, Pars I, Dist. XL. Huguccio pisanus, Summa Decretorum , Pars I, Dist.. XL, c. 6. Salvatore Vacca, Prima Sedes a nemine judicatur. Genesi e sviluppo storico dell’assioma fino al Decreto di Graziano, Pontificia Università Gregoriana, Roma 1993, p. 254. Arnaldo Xaveir da Silveira, Ipotesi teologica di un Papa eretico, Solfanelli, Chieti 2016. Pio XII, Discours to the Bishops of United States of 1 November 1939. S. Ambrose, Expos. Evang. sec. Luc., IV, 49. S. Stephen I, Letter to Saint San Cyprien, in Denz-H, n. 110. 4. S. Bonaventura, De Nativitate B. Virginis Mariae Sermo V, in Opera, cit., IX, p. 717). S. Luigi Maria Grignion di Montfort,Trattato della vera devozione alla Santissima Vergine Maria, n. 57.